So fun to see them out there and be able to get those shots! Have a lovely Christmas! Merry Christmas, JP! We've got rain, do you actually have Snow? Is this view from your kitchen! Hope you have a good Christmas - kids are going to bed here - maybe they will sleep! Wonderful shots of the beautiful animals. How sweet! I hope they live a long and healthy life. 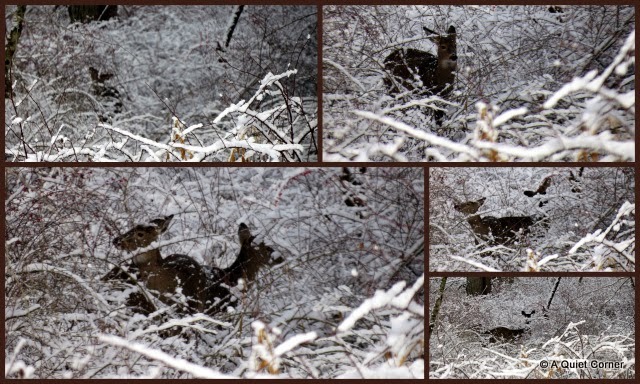 Though they cause great angst for many, I do love the deer, and try to help mine out a bit in the winter - just an apple thrown in the woods once in awhile. I know it wont get them through the long cold season, but imagine how nice it would be to come across if you were a wild animal.